For too long, Regina and her eight children struggled living in a country torn apart by violence. In her hometown of Leer, South Sudan, armed men had burned homes, raped women and killed civilians. Three years of civil war left both the community and Regina’s hope in ruins. Faced with the ongoing conflict, Regina decided to move her family to a Protection of Civilians Camp in Benitu, another town in South Sudan. The camp, formed around a United Nations base, provides some protection for people who have been forced from their homes. Though faced with hunger and the constant threat of violence, Regina gave thanks every day that her children—her greatest blessings—were alive. When a lack of food threatened the life of her youngest child, Regina felt fear and despair like never before. One-year-old Kai was suffering from severe malnutrition. When they arrived at the Protection of Civilians Camp, he was immediately admitted to a feeding centre. The feeding centre is part of a nutrition program supported by PWS&D and implemented by World Relief Canada—a member of Canadian Foodgrains Bank. The project is providing life-saving nutrition support for 42,000 children under five, as well as pregnant and lactating mothers. 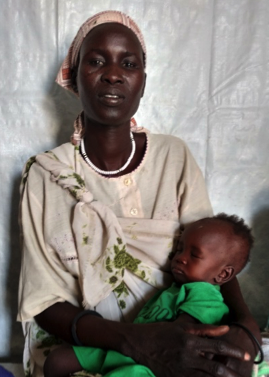 The feeding centres screen children and lactating mothers for malnutrition. If a child is found with severe acute malnutrition, they receive treatment with therapeutic foods. Mothers and children with moderate acute malnutrition are also treated, and caregivers are educated in proper hygiene and child feeding practices. Kai remained in the program for two months before he was discharged, having grown healthier and stronger. Staff continued to monitor his progress by measuring the circumference of his upper arm to see if he had gained weight. Unfortunately, Kai had a setback last month. Unclean water caused Kai to develop an infection and severe diarrhea. After Kai was treated, he was returned back to the feeding centre. Regina reports that she already sees signs of improvement in Kai and is confident that he will regain his full health. She is so appreciative of the local staff that saved her child’s life, taught her about proper nutrition and restored much-needed hope in a time of fear and fragility. Through the Government of Canada’s Famine Relief Fund, donations supporting hunger relief in South Sudan are matched 1:1. Donations to this project are also matched 4:1 through additional support from the Government of Canada through the Canadian Foodgrains Bank. *Read the original story on the World Relief Canada website.